Random House Trade Paperbacks, 9780812978803, 272pp. Charles Frazier, the acclaimed author of Cold Mountain and Thirteen Moons, returns with a dazzling novel set in small-town North Carolina in the early 1960s. 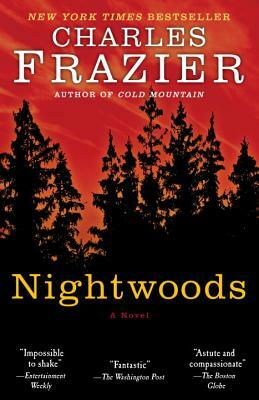 With his brilliant portrait of Luce, a young woman who inherits her murdered sister’s troubled twins, Frazier has created his most memorable heroine. Before the children, Luce was content with the reimbursements of the rich Appalachian landscape, choosing to live apart from the small community around her. But the coming of the children changes everything, cracking open her solitary life in difficult, hopeful, dangerous ways. In a lean, tight narrative, Nightwoods resonates with the timelessness of a great work of art. Charles Frazier grew up in the mountains of North Carolina. Cold Mountain, his highly acclaimed first novel, was an international bestseller and won the National Book Award in 1997. His second novel, Thirteen Moons, was a New York Times bestseller and named a best book of the year by the Los Angeles Times, Chicago Tribune, and St. Louis Post-Dispatch.